Fuel-fired water heaters burn natural gas, propane or oil producing heat that warms water in a storage tank. The heating surfaces for gas- and oil-fired water heaters (fuel-fired water heaters) are at the bottom of the tank. Air enters the combustion chamber, combines with the fuel, and the mixture is ignited. Heat is then transferred to the water through metal surfaces at the bottom of the tank. The vent pipe is an exhaust pipe that carries the by-products of combustion to the outside and also serves as a heat exchanger. This pipe is usually surrounded by the water containment tank and often contains baffles to slow the escape of these gases through the vent, thus allowing more time for heat to be transferred to the water around the pipe. Thermostatic controls regulating the temperature of the water are usually located near the mid-section of gas- and oil-fired water heaters. The proper mixture of additional air with combustion or exhaust gasses is important in fuel-fired water heaters to assist in the safe passage of combustion products up the vent pipe to the outdoors. If their escape is impeded or blocked, serious problems can develop. 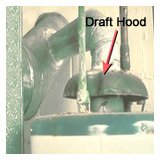 To assure this proper mixture, gas-fired water heaters are equipped with a "cone-shaped" draft hood on the vent pipe, as it emerges from the tank. 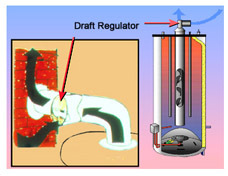 Oil-fired Water Heaters are usually furnished with draft regulators attached to the vent pipe, between the tank and chimney. This is a hinged metal flap with a "counterweight," to allow for variations in flue gas pressure. 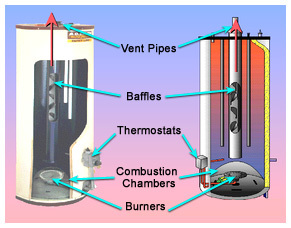 Some gas- or oil-fired water heaters may also be equipped with vent dampers on the vent pipe. This energy-saving device automatically "closes" the vent pipe to prevent the escape of heat to the flue when the main burner is not being fired. This, in turn, slows down the rate at which the water in the tank cools down.